"Love is most complex emotion. A human being's unpredictable. No logic to emotions. Where there is no logic, there is no rational thought. Where there is no rational thought, there can be much romance but much suffering." 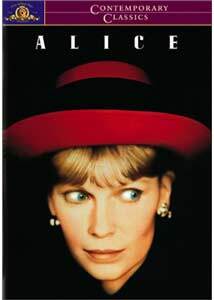 Mia Farrow is Alice, a woman who steps through the looking glass via the magic of a Chinese herbalist and sees herself for the first time. While Woody Allen's films become increasingly harder to categorize, Alice easily glides into the "eh" column. Alice's small town upbringing was steeped in the mystical restraints of Catholicism; at one point, she considered becoming a nun. But when we meet her, she has been married just short of 16 years to Doug Tate (Hurt), a fabulously wealthy businessman who insulates his family with opulent, Manhattan-style luxury. This is about all we ever learn about her husband; his character, as most others in this story, remains fairly one-dimensional. Alice has taken to her insular lifestyle as if she were born to it, ordering her household via her private staff, scheduling her days around spa visits, shopping and retrieving her children from their elite pre-school. It is at this school that she meets Joe (Mantegna), a tenor saxophone player, recently divorced from his more successful wife (Davis). Alice finds him attractive, but her "good girl" conscience barely allows her to entertain fantasies of an affair. When all the medical and therapeutic treatments her money can buy does not cure a persistent backache, Alice consults Dr. Yang (Luke), a folk healer, after 3 different sources recommend him. During the course of the next few days (and the duration of the film), the enigmatic doctor hypnotizes her and treats her with a variety of mysterious herbs: one that gives her enormous self-confidence; one that makes her literally invisible; another she burns to invoke the ghost of a former lover (Baldwin) and finally, a powerful love potion that (of course), falls into the wrong hands. In this time, she reviews her past, understands her current life for the first time and makes a leap of faith into exactly what—and who—she was meant to be. Alice might have been named "Dorothy," or possibly even "Ebenezer." While this kind of "assisted" introspective journey is not new, Allen gives it a fresh twist by keeping the action aligned with the real world. Alice is not visited in her sleep, nor do her transcendental experiences lead her through strange, hallucinatory realms. Any illusory visions come into her daily situations, allowing them to seem possible, if still improbable. Where this approach to self-examination and re-evaluation misses its mark is in exactly that twist: taken out of the realm of fairytales and other allegorical fictions, I wanted Alice to come to conclusions herself, not because of "others," conjured or real. Even the action that leads to her ultimate realization is an accident, caused by someone else, as if she has learned so little that she is still incapable of deciding her own destiny. As Alice, Farrow takes on many of the attributes normally associated with the hapless characters Woody himself plays. A victim of circumstance, she stutters and stumbles through her scenes, passively accepting the things that happen to her. Think about how so many of his own characters are naïvely astonished when the object of their desire says, "This isn't working for me" or "I'm with someone else now." Farrow has now synthesized her own style to be the "perfect" Woody Allen actor. In the last performance before his death the next year, Keye Luke is stern and domineering as the mysterious Dr. Yang, who knows what ails his clients even before they enter his domain. William Hurt is modestly understated as the philandering but providing husband, saving his trademark outburst for his final scene. Joe Mantegna is unremarkable, as he is not given much to do, which remains true of the entire ensemble, save Farrow. In the end, Alice suffers from the lack of Allen's on-screen presence; no one supports his humor like he can, and therefore the comedy drifts aimlessly without his anchor. With not quite enough comedy, drama, fantasy or romance to sustain it, Alice is a somnambulatory effort that fails to open our eyes. Image Transfer Review: As with the all the other titles in this second Woody Allen Collection, MGM presents Alice in anamorphic widescreen. Detail is high and sharp; colors across the various palettes are rich and natural. Fleshtones are realistic and black levels are rich and even. And like the others, this is as good as it gets. Audio Transfer Review: The Dolby mono track is spotless. The dialogue and ambient, trademark jazz tracks blend flawlessly. MGM includes DD mono tracks in French and Spanish, worth a listen to hear how marvelously the voice actors match the screen stars' voices, most remarkably the Spanish track. Extras Review: Subtitles in French and Spanish are included, in white with black outlines within the image area. English subtitles are sorely missed. The theatrical trailer is presented in 1.85:1 and is as fine as the feature's image. The sixteen chapter-stops seems a bit light. A single-fold booklet with production notes is included. Like its title character, Alice fumbles through an identity crisis, unaware of its dilemma. Not funny enough to be a comedy, serious enough to be a drama and too little fantasy or romance to be either, this is one Woody Allen film that is—uncategorically—bland.